Lots of car loan payment calculators are available on the web. Banks and other providers of personal financing often feature online calculators to keep their visitors on their websites. Such a service can be extremely helpful when deciding if a particular vehicle will work for you. Most calculators complete the same task but some are definitely more efficient than others. If you visit a certain personal finance website more frequently than others, it may be the more efficient choice especially if you are already a customer of that provider. If you rarely visit financial resource sites, this list of car loan payment calculators can help you out. OnlineLoanCalculator.org is a standalone site that offers a clean interface. It allows you to factor in your current vehicle’s trade-in value and the new vehicle's sales tax. This site has you enter the length of the loan in years instead of months. It shows an annual amortization schedule that is handy to determine what you will still owe year after year. The total amount you pay for the vehicle over the term of the loan is also displayed. Beware of a couple of well-integrated advertisements close to the calculator. Bankrate.com offers one of the most popular financial calculators. It lets you figure in payments on a 36-, 48-, or 60-month basis; denote if the vehicle is new or used, and set the interest or find an agreeable loan rate from lenders listed on the site. If you have not received hard numbers from a car salesperson, Cars.com has a helpful calculator. It lets you enter in your vehicle's trade-in value and sales tax separately. You can subtract your trade-in value from the cost of your new vehicle and add in sales tax to calculate the amount you are financing or list them separately; it's up to you. Military members and their families can make use of the financial services created exclusively for them by USAA, which includes a streamlined car loan calculator on the USAA website. Users enter the purpose of the loan, model year of the car, loan amount, interest rate, and general credit grade of the borrower. This combination of loan factors will tell you the total cost of the loan. Visitors can then apply for financing or look to refinance an existing loan. State Farm's calculator is meant to not only do the math on loans but also compare loan rates side by side. It allows you to enter the purchase price for the vehicle, the amount of the down payment, terms of the loans, and interest rates. State and federal tax rates are also included. These factors are used to show much interest you will pay over the life of the loan and the total cost of the vehicle, including your loan interest. Kelly Blue Book has simplified its calculator to focus on the loan amount, interest rate, and term. Much of the web page offers links to financing and refinancing options through LendingTree. 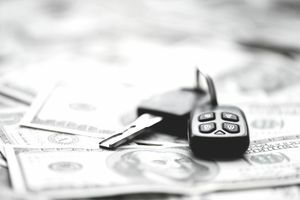 Kelly Blue Book, as well as its sister company Autotrader, entered into an arrangement to offer their visitors lending services from LendingTree's auto financing marketplace. Capital One gets down to business, asking for the loan amount, estimated interest rate, and proposed term length for the loan to calculate monthly payments. Users are invited to get prequalified or learn more about the bank's services and options. In addition to getting prequalified, visitors to the site can search for participating dealers who will accept the financing and search for vehicles within their loan budget. The financing can be fine-tuned for the desired vehicles before visiting the dealers. Try your own credit union or bank’s website for a car loan payment calculator. Most calculators complete the same task with similar efficiency. Convenience might make for the best calculator. While you are shopping for a car loan with a financier, look for a calculator on the same website. Car loans are a very big commitment. Do not underestimate the importance of discretionary spending and an emergency fund. Car loans can easily use up those funds, leaving you living paycheck to paycheck. If at all possible, save money ahead of purchasing a vehicle. Even if you leave the money in your account instead of using it as a down payment on your new car, you will be much better off in the long run.